Here is a card I made with friends few weeks ago. I forgot to post it. My friends and I had a fun time stamping together. It was their first time so it was like having a stamping class with them. I used the Elements of Style stamp set for the images. I did the roses in blue. My favourite colour. One of my friends prefer her's in pink or red. Thank you for stopping by! Happy Stamping! This was what Hope did for her classmates for Valentine's Day. I helped her with stamping and she assembled them. The lollipops was taped to the back of the hearts. Something simple for Hope to do. I made some boxes for the school teachers. There are only 3 teachers so it wasn't a lot to make for. I used the Petal Cone Die to make the box. Do you that you can still get this die? Go to Stampin'Up! website and it is under clearance rack section. Look for this die. It is on sale while supply last. I do recommend to get this die. There is so much you can do with it. It is worth your money. I punched two holes at the top of the boxes and tied them with a tinsel tassel. I think that what's called. It is something I have for a long time so I don't remember the name of it. I filled each boxes with yummy jujubes. Thank you for visiting my blog! Happy Stamping! ETA: You can still purchase the Petal Cone Die over at Stampin'Up! website while supplies last as of Feb. 24, 2014. It is on clearance under the clearance rack. For the past few years I have had many requests for the tutorial for this box. This past week I posted a new box I made using the instructions as the box shown above. Since then, I have had many more requests for the instructions so I have decided to offer the tutorial. It is an old tutorial and some products I used in the tutorial are retired. But, in order to complete this tutorial you will require the Petal Cone Die from Stampin'Up!. Unfortunately, this die has been retired. Now this is my most favoured die and tutorial. Needless to say, this tutorial is for your personal use only. It is not for resale or is for holding craft classes. Thank you and enjoy! 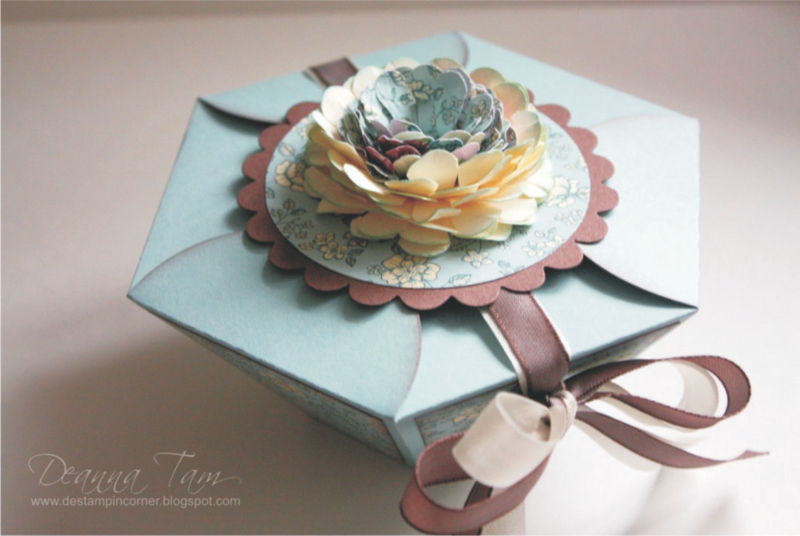 $3.95 Petal Cone Gift Box Tutorial. No refund on digital tutorial. Hello stampers! I made a gift box using the SU Petal Cone Die (retired). I love this die very much. Sad it is no longer available. I'm giving this to a friend's mom who is stamping with me tonight. I'm so excited to have friends over to stamp with me. It has been awhile. I used the kraft card stock that was extra thick and perfect for this box. I made one using Stampin'Up! 's card stock before but not thick enough for me. I can put chocolates in there and not worry about it breaking. I used the Fun Flowers Die and then embossed it with the Vintage Wallpaper Folder to make the flower. Add a Vintage Flower Adornment to the middle of the flower to finish it off. "But the fruit of the Spirit is love, joy, peace, longsuffering, gentleness, goodness, faith, Meekness, temperance: against such there is no law."